As a card-carrying taxpayer, then, I was pleased to read the article in the Journal that discussed how Fannie and Freddie are combing through the billions of dollars of mortgages they have taken on over the last few years and looking for those that exhibit "underwriting flaws." These "flaws," I suspect, mean that the loans are crap, originated without proper documentation and probably little hope of repayment. When they identify loans of this dubious quality, they are forcing the banks to buy them back. As a percentage of loans outstanding, loans in this category don't amount to a big proportion (a total of only about $7 billion in the first nine months of 2009); nevertheless, as a taxpayer it feels good to see the sleaziest bankers being forced to take back some of their own garbage. The article says that Bank of America (proud owner of Countrywide Financial) and JPMorgan Chase (buyer of Washington Mutual) are likely to be the biggest losers. If you enjoy seeing the big banks squirm, you may also appreciate the fact that many other holders of mortgage-backed securities are also kicking the junk loans back and demanding the banks repurchase them. 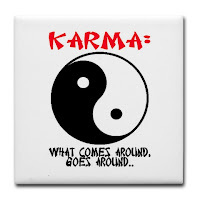 As they say, what comes around, goes around. Have you seen this? I dismayed that these characters seem to have gotten a pass with respect to the Fannie/Freddie debacle. Thanks respecting sharing. Like always, on the money and bang on on quarry!